MBL News is the leading South Australian trade magazine for butchers. 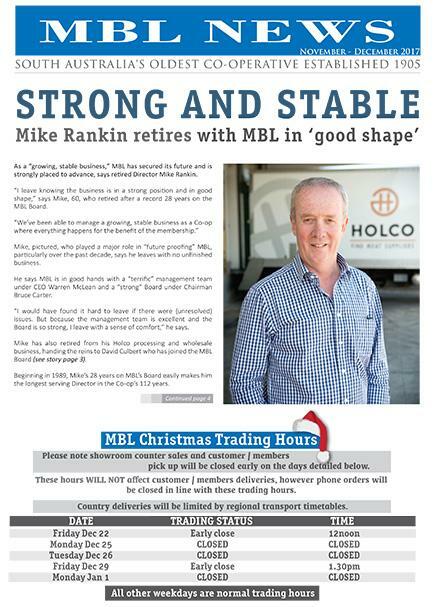 In this edition we farewell Mike Rankin who has retired from MBL's Board. His 28 years service makes him the longest serving Director in the Co-op's 112 years and he leaves MBL with the Co-op in 'good shape'. Also a sharp rise in Pink Butcher support has seen a total of 129 South Australian butcheries participating in this year's Pink Butcher Breast Cancer campaign, with great results expected to be finalised in December.